I’m going to start by saying that first of all, this shouldn’t happen. Measure your paper properly to begin with and you won’t find your box peeking from beneath the gift wrap at the sides. However, sometimes even the best of us run out of paper. My advice is usually to start over with a new sheet, but sometimes this isn’t possible. Maybe the box is too big for the width of the roll. Maybe you’re in a rush and don’t have time to start again. Or maybe you just don’t want to waste the paper. Whatever the reason, sometimes you need to make up for shortcomings. Now, the goal here is to make your present look as polished and professional as it would if you had had enough paper. You want to make hiding the remainder of the box look purposeful. In this case, it’s all about shape. Cut a circle large enough to cover the gap. Use a circular object as your template and trace around it with pencil onto the back of a scrap of wrapping paper — either the same paper as what you’ve wrapped the box in, or a complementary colour or pattern. Once cut, attach a few pieces of double-sided tape to the back of the circle. Centre on the end of the gift, over the gap, then stick down. Do the same on both ends, even if only one end shows the box. Your final result will look like an extra-large seal or sticker. Everyone will think you meant for the present to look that way. It’s all about turning a mistake into a finishing touch. This is such a great idea! I am horrible at wrapping and also miss-measure! This is such a great way to make it seem like I was trying to be fancy, rather than just plain sucking at wrapping. Great tip. I do this constantly. This is why my husband is now the go-to wrapper in our house! Thanks for the comment, Holly! I have done something similar to this, many, many…oh so many times. Especially with the irregular shaped boxes and packages. Where you have that scrap of wrapping paper and really feel like you need to use it. I never learn. I have to agree with Heather – this is fantastic!!! GENIUS!!!! This happens to me all the time. 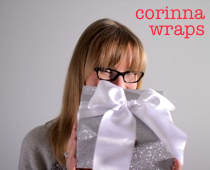 I end up hiding a piece behind the wrapping paper… but this is way easier and way cuter!! Yes, this is a much easier way, Christine. I imagine trying to get a piece behind the paper can be a little awkward. Excellent! I am ashamed that I do not measure my paper first…and I’ve found myself in this situation many times. I will likely still not measure my paper and so thank you for the tip – I’m certain it will come in handy!